Create a stunning winter wonderland out of your pops for the holidays. This is a fun crafting project, as well as a unique and eye-catching dessert. The winter wonderland pops can be decorated in two ways. The first is to make a glittery mint swirl pattern. You can also turn your desserts into snowman pops. I went with a ice pop brand that is affordable and easy to find, no matter where you live in the United States. Budget Saver Sugar Free Twin Pops come with white and red pops, which are perfect for this project. Find your Buget Saver Ice Pops through the store locator under the "Find Favorites" tab. Using a pop wrapper, I drew a swirl with a marker. Cut it out to use as a template. Place template on the wrapper of a red popsicle. Dip your paintbrush in modge podge, scraping off any excess glue. Paint a lined down the border of your template. Remove template and fill in the rest with more glue. Make sure your glue layer is thin and even. Pour fine white glitter over glue, then shake off. You can use your pinky finger or a clean paintbrush to wipe off excess glitter. Make sure to work quickly to prevent popsicle from melting. 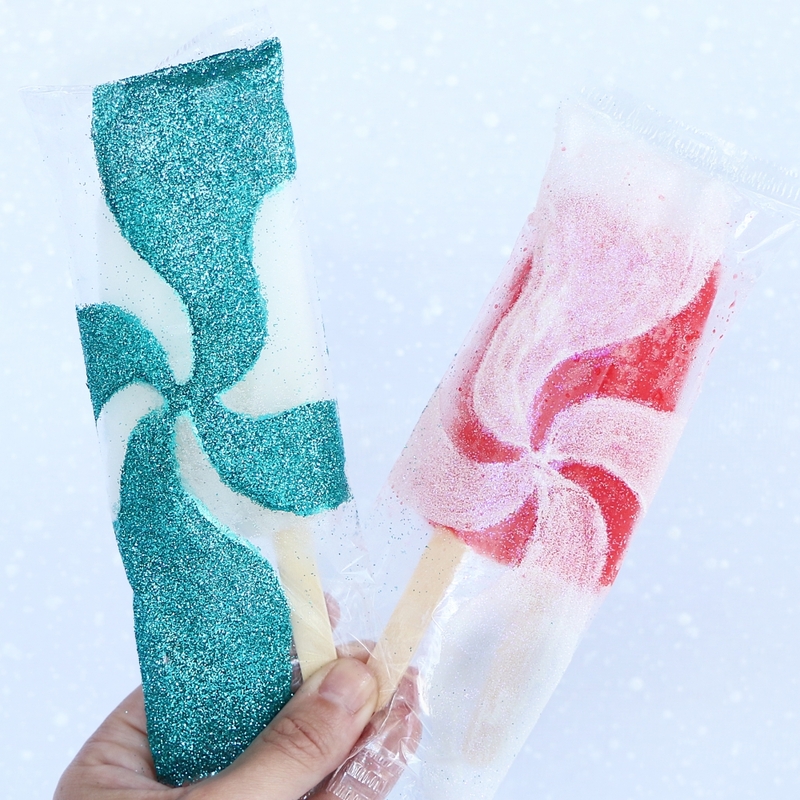 Place in freezer, then repeat the same process, but with a white popsicle and turquoise glitter. Rotate through pops, adding swirls around the wrappers until complete, storing in freezer in between turns. When finished, leave all pops in freezer until serving. 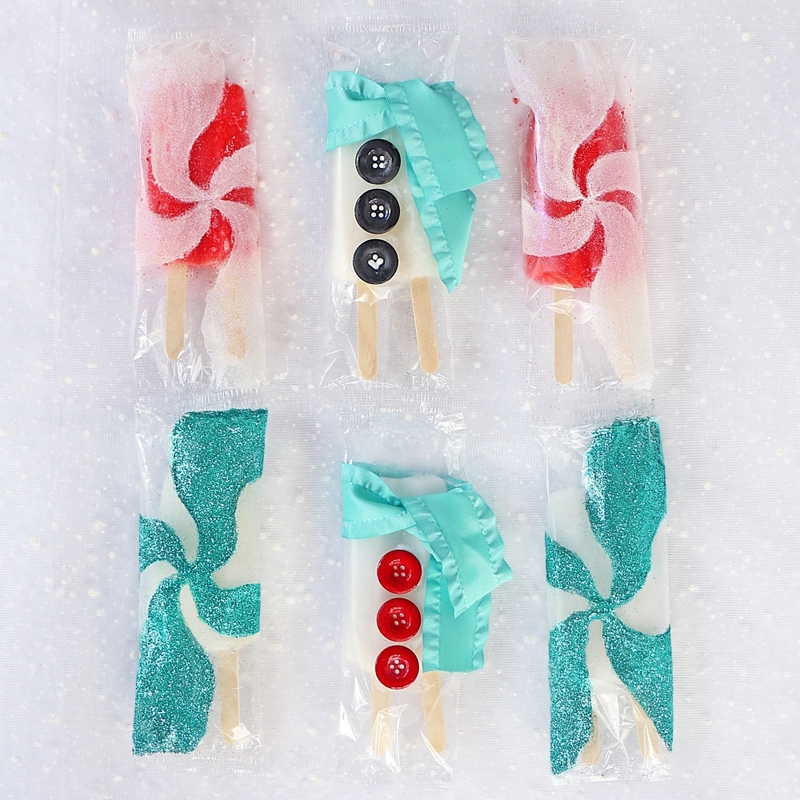 Glue the back of three buttons, then place down the center of the wrapper around a popsicle. I used white popsicles, to look like the snow of a snowman. 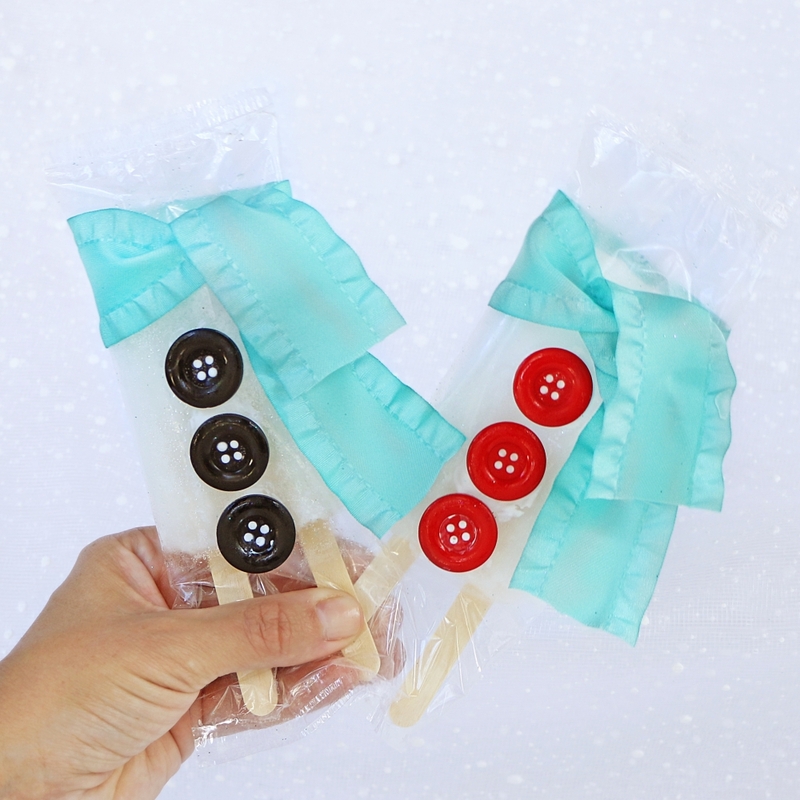 Tie turquoise ribbons around popsicles, to look like scarves. Use tape to adhere the top stray piece to the bottom piece so that they stay put. Leave all pops in freezer until serving. Find all of Jasmin Fine's craft ideas and recipes at 1finecookie.com. On the site, check out the how-to video for Winter Wonderland Decorated Ice Pops.